As part of the The Yacht Week family, I have seen it is one of those special environments created by people motivated by adventure, spontaneity, culture and optimism. An environment so special we can all agree to say that this country really is called The Yacht Week. It is not just a week long trip in the sun above the most pristine waters in the world, but rather a week long dream that has ultimately become a reality you can live. You can live the experience by coming to relax for a week to meet people from all over the world and party together in some of the most dreamy destinations.You can become a host or hostess by joining The Yacht Week to make it the best event of the summer... Or you can show off your most gnarly sailing skills and become a skipper! [margin10] Now, with the creation of The Skipper Academy, all of the above is possible. I myself will be getting down right into the action to provide you all with the most accurate and entertaining news straight from the ropes. Want to see some top-quality sailing? Find out where your skipper is from? How many languages can he speak? 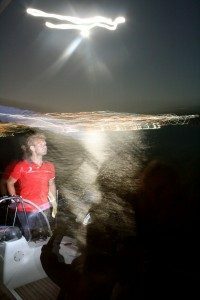 Or what does he do in the real world when he´s not sailing as a skipper for The Yacht Week? [margin10] The Skipper Academy is offered to ensure that The Yacht Week has the best quality and experienced skippers. You may want to take a sneak peak at who might be your very own skipper this summer or perhaps you want to learn a bit about sailing as well, after all this is The Yacht Week, it wouldn´t hurt! Stay tuned for daily coverage of the skippers in action! The skipper at The Yacht Week is prepared, optimistic, experienced and always willing to show their crews a great time and what The Yacht Week is all about. The skipper will be your guide, protector and even your friend. He can handle anything from a stuck anchor to an exhilarating race of over 60 sail boats. The skipper will be present at all times, from the most peaceful day trips from island to island to the most outrageous parties. What is the plan for today? How do we put up the sail? I need First-Aid and there are no more taxi-boats available at these hours, can you come pick me up? The Skipper at The Yacht Week will be there to answer any of these questions and more. After all, he is the one pulling the ropes, so let live and let sail!